This room brings together an extensive group of Seagram murals uniting, for the first time, eight of Tate’s murals with a selection of those from Kawamura Memorial Museum of Art, Sakura and the National Gallery of Art, Washington. 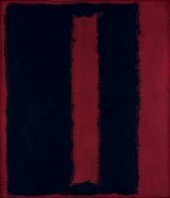 Rothko never devised a ‘final’ scheme for The Four Seasons restaurant. His studio assistant, Dan Rice, recalls that Rothko ‘was very reflective, gathering all the paintings together again and jumbling them up. It would be very difficult to say that one was intended as part of the murals and one was not’. 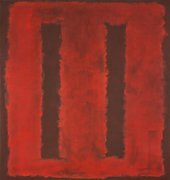 Rather than speculate about the scheme for the Four Seasons, the murals are presented here as Rothko’s first series, in which each work from its very inception enters into a direct dialogue with its counterparts. 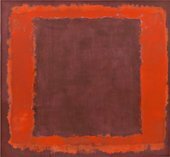 Within a comparatively narrow compositional scheme, Rothko experimented with varying permutations of the floating ‘frame’ and its background, different surface treatments and the use of vibrant and sombre colour. 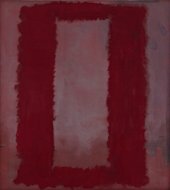 Though The Four Seasons offered space for only seven murals, Rothko eventually executed thirty canvases. For his retrospective at the Museum of Modern Art, New York in 1961 he identified five of these as Mural Sections 2–5 and Mural Section 7. These are displayed here in consecutive order. The other canvases on view are similar in format and degree of finish, the only exception being the two narrow landscape formats which were originally intended to be hung above the dining room’s folding doors. 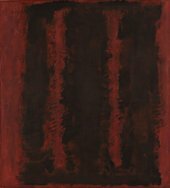 When his 1961 retrospective travelled to London’s Whitechapel Art Gallery, Rothko requested that the murals should be hung high, as that was how they were painted, and shown on a warm background colour, which is how they are displayed here.